Unique floor plan features 2 large bedrooms. Totally Remodeled Floors to Ceiling. Wonderful Open Floor Plan. 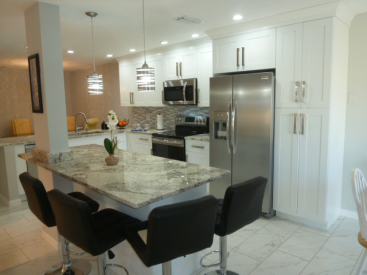 New Kitchen features Granite Counters, New Stainless Appliance Package, Large Kitchen Island Counter, Crown Molding, Plus separate Breakfast Table Area and Formal Dining Room. New Tile throughout, Both Bathrooms Remodeled, new lighting fixtures, Living Room Features Sliding door to covered Patio Area - Backyard with open patio area. Master Bedroom with Sliding door to your private enclosed, screened room. This one story villa features parking in front of your unit Plus guest parking. Washer and Dryer in unit. Monthly fees include Water, Cable TV, Insurance and much more. ALL FURNITURE NEGOTIABLE.